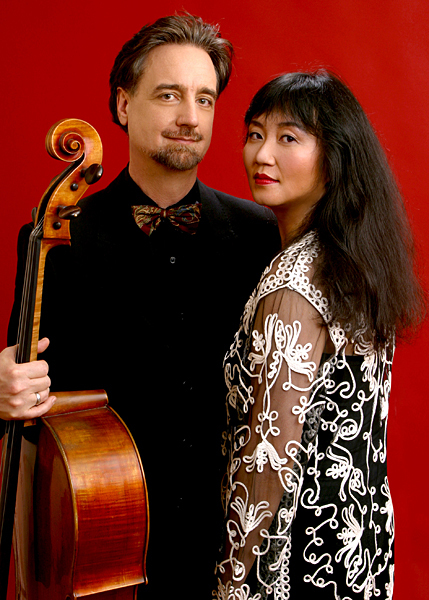 David Finckel and Wu Han performed the complete Beethoven cello sonatas Sunday afternoon at Jordan Hall. Performing cycles of Beethoven’s music is no small task. The symphonies, string quartets, and piano sonatas, just to name a few, may fill an entire concert season. Fortunately, the composer’s cello sonatas fit neatly into a single, if tightly packaged, program. That was the case Sunday afternoon at Jordan Hall when cellist David Finckel and his wife, pianist Wu Han, offered Beethoven’s five cello sonatas as part of Boston’s Celebrity Series. These works, while not always among his most memorable or tuneful chamber pieces, span the composer’s creative life. Finckel and Han’s delicate and finely balanced reading brought out depths not normally heard or appreciated in these early sonatas. The duo’s sensitive, almost free-flowing approach to the tempo gave shape to the opening Adagio of the Sonata in F major, the first in the Op. 5 set. The second, Sonata in G minor—the only one of the five sonatas cast in a minor key—also contains moments of poignant lyricism. Han opened with a recitative-like phrase that is free and direct in its expression. Finckel answered with lovely, singing tone to fit the ensuing air. The fast movements quickly revealed both works to be show pieces for Han, whose sparkling technique gave lift to the dizzying and punishing piano runs. The scherzo-like rondo of the F major sonata danced from the lilting triplet figures traded between Han and Finckel. They also brought shading to the minor key passages in the movement’s inner sections. Their expressivity, though, resulted in a cautious reading of Sonata in G minor’s second movement. Cantabile phrases abounded, but the tempo, marked Allegro molto più tosto presto, was surely too slow. That wasn’t the case for the closing rondo, which featured the cellist and pianist in a dazzling display of musical fireworks. Beethoven’s Sonata in A major, Op. 69 (1808), has little of these show-stopping qualities. Instead, the composer, in this and in other works from this time, explored a wider musical language. Here, as well, the two instruments are equal partners, a style he had developed with the “Kreutzer” violin sonata. Han and Finckel found a symbiotic balance from the beginning. The dramatic music that unfolds in the sonata’s four movements invited more forceful playing from the duo. The scherzo, a rugged, off-kilter affair, featured the musicians in their sharpest dialogue. The Adagio, a mere eighteen measures of music, featured them in elegant and haunting lyricism. With crystalline playing throughout, Han sculpted each passage in fine detail. Finckel answered with aplomb. Their light turns and trills graced the melodies like ornaments atop Greek columns. By 1815, Beethoven’s style had grown more introspective. The last two cello sonatas, Op. 102, though shorter than any of his works in the genre, are goldmines of expression. The musical ideas often break midstream and change course several times as if searching for definition. These pieces also hearken back to earlier forms. The Sonata in C major, Op. 102, No. 1, with its slow-fast-slow-fast arrangement, is structured like a Baroque trio sonata. The second, the Sonata in D major, closes with a grand fugue. Some of the most arresting playing of the afternoon came in the slow movements of both works. Han and Finckel’s rendering of the C major’s third movement, a contemplative and spacious Adagio, resonated with sweet lyricism. They brought a sense of yearning to the D major’s funeral march, teasing the music from low, distant murmurs.